Spring steel is a low-alloy, medium-carbon steel or high-carbon steel with a very high yield strength. This allows objects made of spring steel to return to their original shape despite significant bending or twisting. Spring steel is also commonly used in the manufacture of metal swords used for stage combat due to its resistance to snapping or shattering. [dubious – discuss] Spring steel is one of the most popular materials used in the fabrication of lock picks due to its pliability and resilience. Tubular spring steel is used in some of the smaller aircraft's landing gear due to its ability to absorb the shock from landing. Applications include piano wire, spring clamps, antennas, and springs. We are highly involved in manufacturing, trading and supplying an exclusive array of Steel Spring. Our springs are made with premium quality raw material and latest technology in adherence with international quality standards and norms. Due to their durable finish standards, rust resistant finish, flexibility and sturdiness, these springs are highly treasured by the customers. 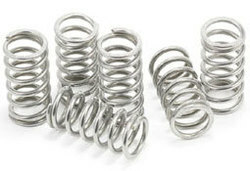 Offered in various sizes, shapes and other related specifications, we provide these springs at most competitive prices. Hitesh steel response to the growing demand for the benefits of stainless steel goes beyond their commitment to the inventoried stock line; as a global provider of custom springs, hitesh steel can design and manufacture an unlimited variety of spring configurations and specifications in stainless steel and a wide range of alloys, including 17-7, beryllium copper, phosphor bronze, inconel and many more. Avail from us wide range of stainless steel springs designed to offer resistance to pulling forces as well as to absorb and store energy. These extension coil springs can be provided in varying lengths and degrees of tension as per the various pulling forces. We provide a standard range of extension springs in hook and crossover loop ends. Our industrial springs comply to all standards and norms of the industry hence they are demanded for their efficacy and high performance. We also have the capability to design and manufacture springs of specific dimensions according to client's industrial requirement. We are instrumental in offering a wide assortment of stainless steel springs that is widely used for reducing vibrations and jerks. Widely used in transmission towers erection, railways, automobiles, electrical and in many other engineering applications, these springs are highly demanded and are offered to clients at nominal rates. Moreover, these can also be under high-temperature conditions. We offer these stainless steel springs to our highly esteemed clients in numerous sizes and designs to meet their bulk requirements. Also, these stainless steel springs and extension springs are delivered to clients on the given frame of time. Additionally, these industrial springs are well appreciated by clients for their tolerances and special working conditions. Stainless steel springs are suitable for applications in diverse industries, including.